Overview - Agnès Letestu and José Martinez are the stars of this deeply passionate, ‘dream’ version of Rudolf Nureyev’s Swan Lake under the inspired and clear-cut musical direction of Vello Pähn. This production, one of the jewels of the Paris Opera Ballet’s repertoire brilliantly displays the meticulous precision, technical prowess and pure, unmannered style of the company’s unrivaled female corps de ballet. "Swan Lake" is a complex ballet written and orchestrated by 19th century Russian composer Pyotr Ilyich Tchaikovsky. While his heritage and training caused him to struggle with the conventions of Western music, Tchaikovsky emerged as a unique voice that wasn't limited by the divisiveness of his Russian influences and peers. His unwavering melodic lines and commanding sense of harmony and thematic repetition has allowed his compositions to thrive and retain the impact they had when first performed. 'Tchaikovsky: Swan Lake' features a 2005 television production of the classic ballet performed by the Paris Opera Ballet -- a company known worldwide for their exquisite precision and technical prowess. And, in so much as I can tell from my limited knowledge of ballet, their skill is on full display. It's clear that the production had a comfortable budget, and the finely-honed talent of the dancers is obvious from beginning to end. Even more impressive is the orchestra's rendition of Tchaikovsky's music -- they inject a depth and weight to the movements that bring them to life. For anyone who doesn't know the story of "Swan Lake," it's surprisingly simple and refreshingly dark. Anyone expecting a fairy tale with a happy ending will certainly find themselves waiting for another act after the dreary finale. The tale focuses on Prince Siegfried (portrayed by Jose Martinez in this particular production), a somber ruler who must choose a wife at his birthday celebration. He longs to marry for love, but knows that he is bound to tradition and inevitable dissatisfaction. While sleeping in the forest, he encounters a flock of swans led by a strange creature that's more woman than beast. Siegfried discovers she is indeed a woman (Agnes Letesu) -- her name is Odette and she's been cursed to live as a swan by a sorcerer named Von Rothbart (Karl Paquette). To break the curse, Siegfried must declare his true love for Odette. While some versions diverge from this point forward, the performance by the Paris Opera Ballet stays close to the original ending. The night of Siegfried's birthday arrives and his guests gather to hear who he will marry. He anxiously searches for Odette and finally sees her emerging through the crowd. 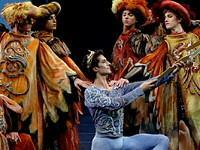 However, Rothbart has manipulated Siegfried's vision so that he believes another woman is Odette. When Siegfried publicly professes his feelings to the wrong woman, the real Odette appears and the lovers realize what has happened. Rothbart is victorious in his evil scheme, Odette is left in the form of a swan forever, and Siegfried is married to a woman he despises. The end. Directed by Francois Roussillon, this version of "Swan Lake" is based on Rudolf Nureyev's psychological and surreal take on the tale which debuted in 1984. It ups the Freudian musings of the ballet's subtext and downplays the role of Odette to window-dressing. She simply serves as the dues ex machina for Siegfried's personal tragedy -- her tale seems to be buried beneath his angst and the promotion of Rothbart to an equal component of the story. Fans of the ballet are split between this modernized interpretation of "Swan Lake" and its more traditional presentations. My ideal production would retain the psychological nuances of Nureyev's version, while focusing more on Odette and her tragedy. As it stands, I enjoyed the layered minutiae of this modern approach, but wish the production featured an inclusive tragedy that wasn't so misogynistic. Unfortunately, regardless of interpretation, the real tragedy here is the horrid acting. Maybe it's the high definition image, but I found myself paying close attention to the lackluster expressions and lack of passion that the performers seem to employ. While the ballet dancing is wonderful and technically precise, the performances lack soul and emotion. Martinez is a mess, his face is often blank in the midst of tragedy and he delivers a boring portrayal of Siegfried. His anger, sadness, and rage overreach, seeming too similar to one another -- everything is tempered by poorly-conveyed angst and he fails to convincingly fall in love with Odette. As for Letesu, she may as well be a mannequin -- floating through the performance with scowls and frowns, she is completely at odds with her own character. She doesn't come across as vulnerable and cursed, but as bitter and hopeless. The two have no chemistry when they share scenes, and the entire love story swirls down into the vortex of their lethargic emotions. Even the dual-role heaped on Paquette's shoulders (Rothbart and an advisor to the Prince) fails to impact the audience as it should -- his villain relies on too many smirks and raised eyebrows, while his role as Siegfried's friend doesn't sell his influence. When Rothbart appears as a black swan, Paquette strides across the stage like a peacock rather than the vicious bird of prey his character should be. Like Martinez and Letesu, he seems to have been cast for his ballet skills alone. In my opinion, a dancer needs more than technique to connect with an audience. In the end, the ballet is technically impressive and the music is extraordinary, but the production lacks the emotional core that's required to make the tragedy compelling. While I enjoyed the non-traditional take on the story, I couldn't get past the bland expressions and poor acting from everyone on stage. This production was produced for television and it feels like it every step of the way. Presented in 1080i with the VC-1 codec, 'Tchaikovsky: Swan Lake' has a richly textured transfer that will please fans. Colors are vivid, black levels are inky, and detail is quite breathtaking. Just look at the costumes and cloaks worn by the various dancers -- I could see individual stitching and accents on every inch of the costumes. Hair and sweat were particularly well defined and long shots of grouped dancers were sharp. From the first time the camera pulled back to focus on parallel rows of dancers in the first "Scena", I consistently noted the tiniest details no matter how far back the producers pulled the shot. I expected to find softness in occasional shots like this, but was pleased to see the picture remain crisp regardless of the on-screen imagery. The only thing that brings the impressive transfer to a halt is a series of technical discrepancies that distracted me throughout the performance. There were brief spats of digital noise when the video would cut between camera angles, compression artifacts mingled in with the fleshtones during close-ups, some light screen-dooring on long shots, and minor, infrequent edge wavering in highly contrasted scenes. Worst of all, the video is plagued by judder (in this case it's inherent to the 1080i/60 source which, according to producer Ferenc van Damme, actually uses a mix of 50i, 60i, and 24p). For those of you who aren't aware of the nature of this rare issue, "telecine judder" appears as a series of horizontal white lines in various areas of the image. In 'Tchaikovsky: Swan Lake,' long shots give way to judder around the edges of the performers as they dance against the darkness of the stage. The small white lines appear along the edges of their arms and legs, flicker for a moment, and then disappear (it's especially noticeable in chapters 8, 13, and 18). The problem is the result of 3:2 pulldown -- the process used to convert 24fps footage to 29.97fps for home video. In simpler terms, 3:2 pulldown converts every four frames of film into five frames. Since the odd number of frames can't perfectly resolve the even number of feeds in an interlaced image (like 1080i), the white lines will pop into view for a split second. The same issues appear on the standard DVD and have been documented at length on a variety of message boards. All in all, while 'Tchaikovsky: Swan Lake' delivers a decidedly beautiful high definition version of the ballet, the glaring technical discrepancies of the DVD have been uncorrected and hinder the impact of this HD DVD. If these issues had been corrected, my video score would have been significantly higher (most likely a 4.5). 'Tchaikovsky: Swan Lake' features two audio tracks -- a DTS 5.0 surround mix (48kHz / 24-bit / 1.5 Mbps) and a DTS 2.0 stereo mix (48kHz / 24-bit). The stereo track obviously yanks all of the sound forward and loses the ambient acoustics of the notes bouncing around the performance hall. The surround mix, on the other hand, showcases robust dynamics and a stable soundfield that really sells the realism of the musical performance. The clarity of the strings had me initially fooled into assuming this was a lossless track and the bass lines have a strong presence despite the absence of an LFE channel (a low frequency effects channel -- noted by the ".1" designation in a typical "5.1" surround mix). Channel pans are particularly nice as violins and cellos swell across the soundscape. Lighter instruments like clarinets, oboes, and flutes are also well prioritized in the mix and never feel lost in the chaos of the horns. It is slightly disconcerting to hear nothing but the music (even in close-ups where it seems the dancers should land on the stage with some bit of sound), but this is common to ballet recordings and a quality that fans apparently prefer. My only real quibble with the audio package is that it doesn't take advantage of the high definition format. The inclusion of an LFE channel and a lossless audio track would have gone a long way to solidifying the oomph of the mix. Despite the prowess of its instrumentation, the DTS 5.0 mix is too similar to a standard DVD track to warrant higher marks. The only supplements included on 'Tchaikovsky: Swan Lake' are a three-image "Cast Gallery" and an informative English-language "Synopsis" (4 minutes) of the story presented in high-def. 'Tchaikovsky: Swan Lake' features a technically precise performance that fails to impress due to the short-sighted emotional performances of its three leads. The video is marred by glitches and noise, the supplemental package is nearly non-existent, and the entire production feels weighed down by average production values. Luckily, a top notch audio track keeps Tchaikovsky's compositions vibrant and kinetic. Fans of classical music performances will find a lot to love here, but ballet fans will be disappointed.